The Mura wall sconce light by Tech Lighting is modern, urbane and environmentally friendly, featuring an organic wave pattern that elegantly graces the sleek glass panel. This hand-carved glass or Veritas® ResinArt™ is not only beautiful it’s also eco-friendly being composed of 40% recycled content. Lighting this wall sconce is a small LED light source neatly concealed behind the river inspired glass diffuser. 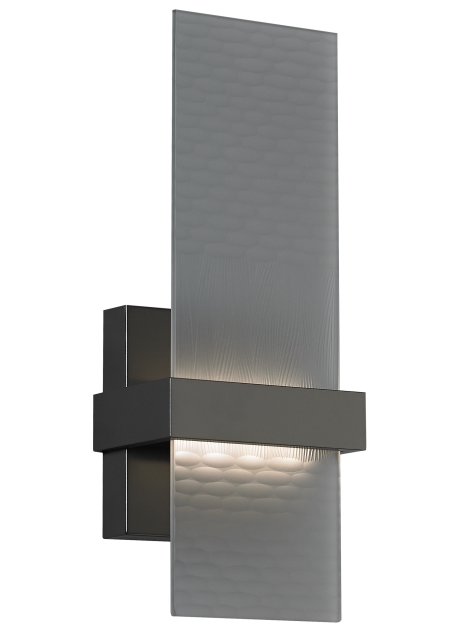 The Mura is available in two modern colors, frost glass and smoke glass, and is finished in your choice of either satin nickel antique bronze. Mount this modern fixture in places such as hallways, bathrooms and closets. Your choice of LED lamping ships with the Mura saving you time and money, both LED options are fully dimmable to create the desired ambiance in your special space. The organic pattern of waves across the panels is inspired by the flow of a river. Mounts up only. Includes 8 watts of 3000K (400 lumen) LED. Dimmable with lowvoltage electronic dimmer. ADA compliant.